Let's face it, essential oil parties are a whole bunch of fun! Take them to another level by preparing foods for your guests infused with flavorful essential oils. Young Living Essential Oils (5-15 drops). Your choice of Lavender, Orange, or Peppermint (adjust the amount of essential oil to your taste preferences). * Peppermint is very strong… consider starting with just one drop of peppermint oil and adjust accordingly. Prep Time - about 1 hour, plus the time needed to "cool" the truffles. NOTE: You can NOT cook with any essential oil! Most essential oils are not therapeutic grade, thus are not for internal use. They are cosmetic/fragrant oils. Please do not cook with your essential oil unless it is Young Living or food grade safe! **We do not advocate the use of any other brand of essential oils in food preparation as they are generally aromatherapy grade and are typically labeled with precautions against using them in any other fashion. Preheat the oven to 350 degrees. Grease a 9 x 5-inch loaf pan, or coat with non-stick spray. In a large bowl, combine the butter and sugar. Beat with an electric mixer until fluffy. Add the eggs one at a time, beating well after each addition. Sift the all-purpose flour, baking soda, and salt into a medium bowl. Stir in the whole wheat flour and beat into the butter mixture. Fold in the bananas, blueberries, walnuts, lavender, and vanilla. Bake for 50 to 60 minutes, or until a cake tester inserted in the center comes out clean. Cook chopped onions until soft and tender. Melt butter in a skillet or saucepan. Stir in onions, then gradually stir in flour until smooth.Gradually stir in broth, pumpkin,honey (or brown sugar),salt and pepper, bring to a boil. Reduce heat and simmer for 5 minutes. Add milk/cream; cook for 2 minutes or until heated through. Drop in the Young Living cinnamon bark essential oil and nutmeg essential oil( see below). Stir, let it simmer for one minute, remove from heat and serve warm. Yield: 6 servings. If you have never cooked with essential oils, you might want to start with less. Instead of an entire drop, which might be too strong for your taste, you can start with just dipping a toothpick in your oil and stir in your food. Do you cook with YL essential oils? What is your favorite recipe? Do you make pumpkin soup? How do you make it? Which ingredients do you use that i didn’t mention? Share with us in the comments below. 2 drops of YL Lime (or Lemon) Essential Oil. *Mix all ingredients in a salad bowl & serve. *Melt chocolate on low heat, add coconut oil, add Peppermint EO & mix. Pour 1 Tbsp into a candy mold tray and place in fried or freezer. Serve & enjoy! *Pour into mini-muffin pan or candy mold (ice trays work well too), about 1 Tbsp each, and place in fridge or freezer until hardened. Serve & enjoy! Simply add 8-10 drops of YL Peppermint Essential Oil to your favorite brownie recipe or box mix! *** Peppermint is very strong… consider using a drop of peppermint oil and adjust accordingly. Can also drizzle with more melted chocolate and coat with toasted coconut, finely ground nuts, orange zest, etc. 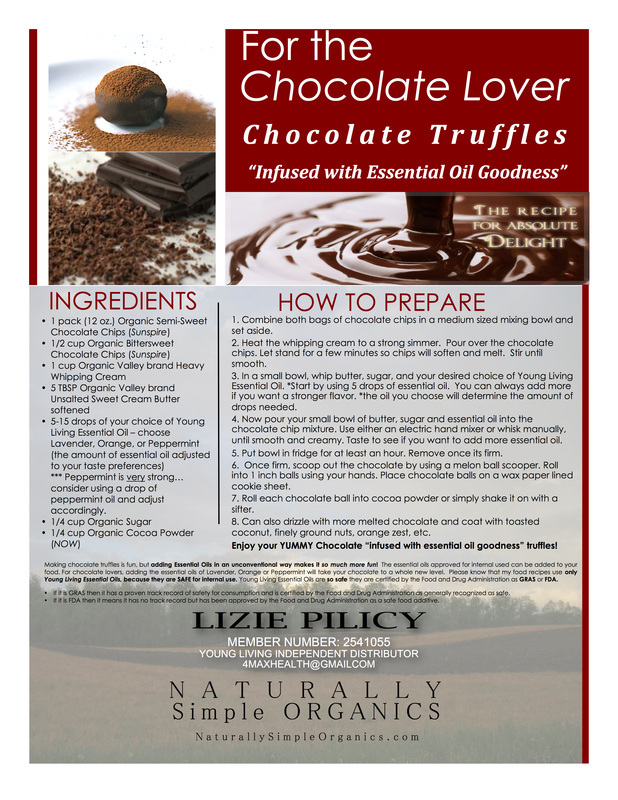 Enjoy your YUMMY Chocolate “infused with essential oil goodness” truffles! Cream the butter, cream cheese and sugars together until smooth. Add the essential oil drops, vanilla and eggs and mix again. In a separate bowl mix together all of the dry ingredients so they can become well incorporated into the dough. Add the dry ingredients to the wet ingredients and mix well. Scoop cookies onto a baking sheet and bake for 9-10 minutes, remove from the oven and dust with powdered sugar. The amount of oil that you use will determine how lemony the cookies are, but remember that the dough will be stronger than the baked cookies. Peal & cut apples, place in mixing bowl. Butter the pie dish; then soften/melt 1/2 stick of butter in a little bowl. Add 3 Tbsp ground cinnamon, 1/4 cup organic white sugar, 1/2 cup Brown sugar. Mix all ingredients together in a mixing bowl. Then pour all contents into your glass baking dish. Cover with foil, bake at 425 for 45-50 min. Remove foil for last 15 minutes. Let cool, and serve with Vanilla ice cream. Lemon Tea (hot or cold) – boil water, add tea bags (for 1 Gallon: 4-5 tea bags of lemon tea, green tea, or your favorite tea), steep for 10 minutes, then remove tea bags. For 1 Gallon: add 3-4 drops Lemon essential oil. 1 Gallon of Purified drinking water. Add 1-2 drops of peppermint. Add essential oils - Lemon, Grapefruit, & Lime. (Only 8-12 drops total of EO’s for 1 Gallon of water). A few drops of your YL essential oils, to taste, such as lemon, lime, orange, or tangerine! Make a simple syrup using a scant amount of boiling water to dissolve the sugar. Mix together in a large pitcher all ingredients including cooled simple syrup…except the club soda. Add chilled club soda before serving. Fantastic taste with no "junk-juice" (e.g., apple, white grape, pear, etc.) or added sugar. Contains a great whole food source of protein, fiber, minerals and vitamins. Contains therapeutic grade essential oils of yuzu, lemon, tangerine and orange. Contains natural antioxidants which protect the body against free radicals. It is free radicals that create cell oxidation; therefore Ningxia Red may help prevent against oxidative stress. Highest levels of naturally occurring, age defying S-ORAC activity. Studies have shown that S-ORAC supports cardiovascular health, supports healthy immune function and supports healthy eye function. May support natural detoxing process on a daily basis. Natural form of energy without sugar, caffeine or other artificial stimulants. Can be used to support animal wellness. Assists cats metabolize essential oils more efficiently. Liquid Wellness Smoothies - Liquid nutrition, packed with a super blend of nutrients from nature, our powerful drink products give your guests a shot of wellness for your party. Power Meal Smoothies - A delicious, satisfying, rice-based meal replacement, Power Meal is rich in calcium, antioxidants and amino acids, and delivers an impressive 20 grams of protein per serving plus a complete vitamin, mineral and enzyme profile. Pure Protein Complete Smoothies - Pure Protein Complete is a comprehensive protein supplement that combines a proprietary 5-Protein Blend, amino acids, and ancient peat and apple extract to deliver 25 grams of protein per serving in two delicious flavors, Vanilla Spice and Chocolate Deluxe. Pour honey and apple cider vinegar into a sauce pan. Bring to boil and allow it to reach 300 degrees. Stir the whole time so it doesn't stick!!! Once it reaches 300 degrees, remove it from the heat. After about a minute, add Lemon Oil and stir well. Have a greased cookie sheet and/or candy molds ready. Allow the honey mixture to cool just a bit until the honey is a little less runny. Using a big spoon, drop small amounts onto the cookie sheet to cover the tops of the sucker sticks and/or into the candy molds. Allow them to cool at room temperature until they harden. 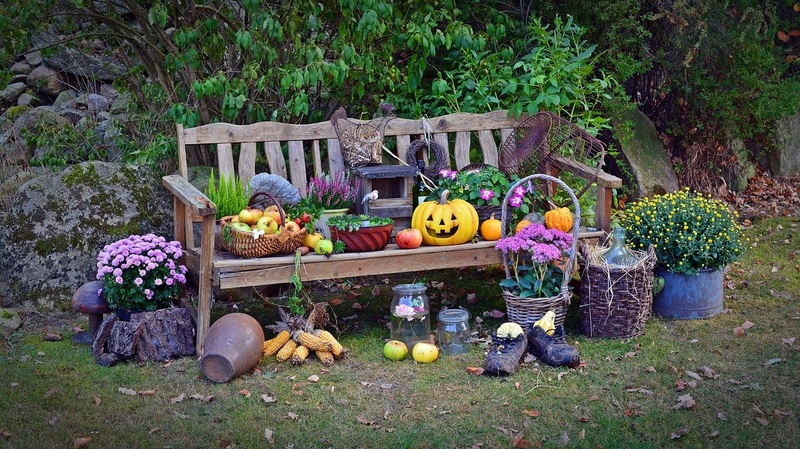 Most of us associate the Thanksgiving holiday with happy Pilgrims and Indians sitting down to a big feast. And that did happen - once. Today we enjoy the biggest meal of the year with family, friends, and football. This year, add essential oils to lift the spirits and deepen the flavor. From anti-microbial to immune boosting, essential oils offer great support for overall health, and when used with cooking add the richest flavors to meals and dishes. Cooking with essential oils is easy, fun, and not to mention delicious! Remove mixture from heat and allow to cool enough to load into baster injector (cool for about 3-5 minutes). With the baster, inject the broth into the turkey, focusing on the breast. Let marinate for a minimum of 2-3 hours, or overnight. Whisk in flour, and cook while whisking for 3-4 minutes, or until slightly brown & smooth. Slowly whisk I n4 cups stock. Increase heat to high. Bring to a boil, keep whisking. Stir in salt and garlic powder, keep whisking. Simmer, stirring occasionally for 10-15 minutes, until desired thickness. Stir in essential oils. Serve warm. Wash the cranberries in a strainer under cool water, and then dump into a medium sauce pan. Pour in 1 cup orange juice. Pour in 1 Tbs maple syrup. Stir together and heat on high to boil. Once at a rolling boil, turn down the heat to medium low and continue cooking over lower heat for about 10 minutes, or until thick. Chill for several hours, and serve chilled. Peal, dice and boil potatoes for 20-25 minutes, until soft. Drain Potatoes and place in a bowl with butter. Allow butter to melt, then add cream. Mash potatoes thoroughly or whip with a whipper. Stir in essential oils, garlic and salt during whipping until desired consistency. Place in serving bowl and serve warm/hot. Cook, peel, and mash sweet potatoes. Mix first 6 ingredients, and stir in Lemon & Cinnamon EO’s. Place filling in 9 x 13” baking dish (glass or ceramic). Spread topping over sweet potato mixture. Bake at 350 degrees for 30 minutes or until brown and bubbling. Steam green beans for 5-8 minutes, until soft and tender. Strain and put the beans in a serving. Add butter while still super hot. Mix in essential oils, salt and pepper. Combine sugar, salt, pumpkin and essential oils in a mixing bowl. Separate eggs, reserving whites, beat egg yolks well. Beat egg whites until soft peaks form and fold into pumpkin mixture. Pour into unbaked pie crust in a pie dish. Bake 10 minutes at 450 degrees, then lower oven to 350 degrees. Bake 1 ½ hour at 350 degrees. Serve with whipped cream, as desired.